GRAFENWOEHR, Germany — Two human resources professionals from U.S. Army Garrison Bavaria were recognized by U.S. Army Europe for their superior leadership and quality of service at the 2018 Fredrick E. Vollrath Human Resources Award For Excellence ceremony Feb. 5. Michele Crawford received the Senior Civilian of the Year Award and Adalisa Diaz received the Junior Civilian of the Year Award while representing Installation Management Command Directorate – Europe. Both are with the U.S. Army Garrison Bavaria Passport Office. U.S. Army Europe’s Deputy Commanding General for Mobilization & Reserve Affairs Brig. Gen. Ellen Clark and Deputy Chief of Staff G-1 Col. Matthew Rasmussen presented the awards. Schneider said the award “is a great way to showcase all that human resource professionals do on a daily basis for all that they do for Soldiers and their families.” Schneider went on to say she felt extremely honored to be selected for the U.S. Army Europe-level award. “I think it’s awesome that we’re recognized alongside our military counterparts because we all performing the same kind of mission serving the Soldiers, civilians and families in our community,” said Crawford. 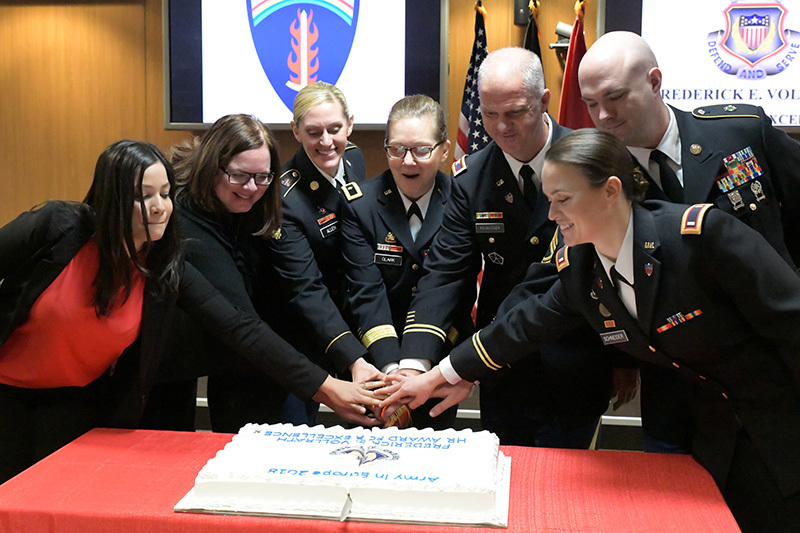 Each year various U.S. Army Europe commands nominate human resource professionals and a panel of senior human resources professionals select the winners. The award namesake, Vollrath, spent 35 years in the human resources field and was the second adjutant general promoted to lieutenant general. The U.S. Army Europe-level winners now move on to compete against their peers at the Adjutant General’s Corps Regimental Association of the Year awards.